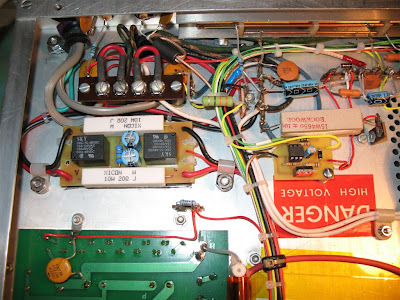 Over the past month I was rebuilding my Heathkit SB-200. When I originally bought the amp on eBay, there were a few small issues here and there - aging components, burnt HV choke, etc. The amp was actually a SB-201 converted to SB-200. It had the 10 meters band added with the original band-switch, tank coil and input network but no other mods. I wanted to update the amplifier and install all of the Harbach mods - HV power supply board, soft-key, soft-start, fan and relay. When I started the upgrades, I quickly realized that I can easily do a complete rebuild by replacing most of the components with modern versions. 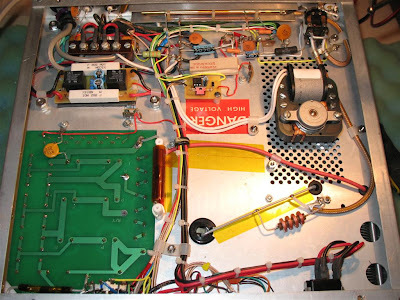 I stripped the amplifier down to the bare chassis and practically started from scratch, using the original Heathkit manual. This is the Harbach High-Voltage Power Supply board. 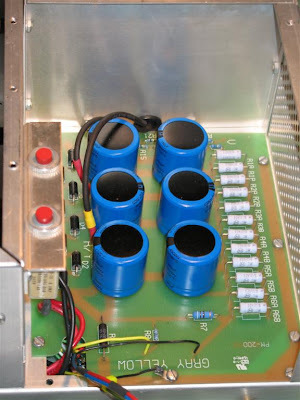 It is an improved version of the original HV board with modern computer-grade capacitors and high-voltage diodes. The equalizing resistors are of higher value and lower wattage. The board is a drop-in replacement. It also includes a string of 1% resistors for the voltage divider in the HV meter circuit. Update: I upgraded the 6 Harbach PS capacitors (180uF/450V) with even bigger 390 uF/450V. This made the power supply "stiffer" and now the amplifier performs better than the stock version. The most obvious improvement is the lower HV drop under full load and a tad higher output power. Such an upgrade (installing high capacity filter caps) should be done only if the Soft-Start mod is already installed. The high-capacity filter caps bank draws much higher initial current (when charged for the first time during a power-on). If the amplifier doesn't have a step-start circuit, this in-rush current surge could trip the internal and/or external breakers (especially if the amp is powered with 120V) and also puts under strain the transformer/rectifier circuit. 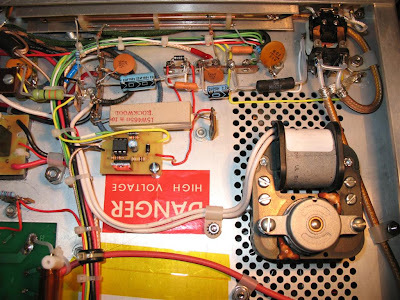 This picture shows the multi-meter, bypass capacitors on the filament voltage line used for the backlight lamp and the new rectifying circuit for the front panel status LEDs. New, larger solder lug terminal strip (with more positions, from Radio Shack) is installed to accommodate the extra components of the low-voltage rectifying circuit - a diode, bypass capacitor and electrolytic filter capacitor. I am using half of the center-tapped filament circuit to supply the LEDs with about 3.5V DC . The half-winding is the same half used to power the Soft-Key module. Two paralleled diodes (A-K, K-A) are installed right across the meter's terminals for protection. In the event of a high-voltage glitch the diodes will clamp the maximum voltage across the meter's coil, saving it from damage. The underside of the amplifier. All wires were replaced with silver-plated/Teflon insulated solid wire. The coaxial lines were also replaced with silver/Teflon MIL coax cable. Almost all components were replaced with the modern type version - the new resistors are metal-film and ceramic-composite type. All capacitors and diodes were also replaced (most of the parts I ordered from Mouser. I also bought some components on eBay and from West Florida Components). The meter switch was carefully cleaned and lubed. Both UHF connectors (SO-239, input and output) were replaced with new silver/Teflon bulkhead type - the old ones were worn out and in pretty bad shape. For the KEY and ALC line connectors on the back panel I installed new female bulkhead BNCs. RCAs will work fine too but they don't have a locking mechanism. The Harbach mods - Soft-Start (left) and Soft-Key (right). I installed the Soft-Start mod by gluing a piece of Plexiglas (with High-temperature RTV silicone) to the chassis and attached the PCB with cable ties through special L-shaped holes in the Plexiglas. Note that while this method worked just fine for me, Harbach recommends different location and way of installation. Harbach sells two versions of the Soft-start mod - for 240V and 120V AC mains. Each version is using different value power resistors. The best way to go is to order the "240V version" plus an extra set of the 20 Ohm resistors even if you are using 120V AC. For 120V AC mains, the extra set is soldered in parallel to the existing resistors. This makes changing the operational voltage more convenient. The directional coupler of the SWR/power metering circuit is seen near the top of the image. The coupler assembly was removed to allow access to the input coaxial cable and for replacement of the RF connectors. I cleaned and re-installed the coupler assembly after replacing the connectors and cable. One should be very careful with the germanium detector diodes (small glass body) - they are brittle and can be overheated during soldering, not to mention that they are also hard to find nowadays. The thin coaxial cables between the coupler's detector diodes and the front multi-meter rotary-switch were replaced with small diameter silver-teflon type coaxial cable. The power cord was changed to a heavy gauge one (AWG #12). Stress-relief is provided by a metal cable clamp. Visible at top left is a ferrite toroid (mix 43) with a few turns of the small diameter coaxial KEY line. This should take care of stray RF in the key circuits. The new fan motor from Harbach and the new Tx/Rx relay. It turned out that the new relay had lower coil resistance compared to the original relay. During Tx mode, the relay coil is part of a voltage divider for the tube's operating negative grid bias. This lower resistance in the new relay coil had to be corrected by changing the value of the coil's paralleling resistor. I did some voltage divider calculations and shared the results with Jeff from Harbach. He adopted the mod and is selling now a new resistor together with the relay upgrade kit to fix this issue. Test measurements showed that the corrected circuit is providing the needed -2V grid bias in Tx mode. This picture shows the high-energy "Glitch" resistor on the right. This resistor is encased in Kapton foil and mounted on teflon stand-offs. The high-voltage red wire going to the RF deck was salvaged from the power supply of a microwave oven - it is rated for 10kV. At the top of the picture are visible components of the front panel status LEDs as well as the current limiting resistors for the LEDs (located in teflon tubing). Also visible is the back side of the Operate-Stand-by switch. I used a bi-color LED to show the amplifier's operational status - Green when the amp is in stand-by mode and Red when in Operate mode. A blue LED is used to indicate the status of the KEY signal. Extra bypass caps are installed at the Stand-by switch line and LEDs. The switch is DPDT type - one pole of the switch is used to interrupt the KEY line (between the KEY jack and the Soft-Key module) and the other pole is switching the bi-color status LED. Picture of the glitch resistor, main wire harness, some of the front panel LEDs circuit, the multi-meter switch and potentiometer. Also visible is the HV diode string (3 diodes in series) used to protect the meter during a HV "glitch" event. 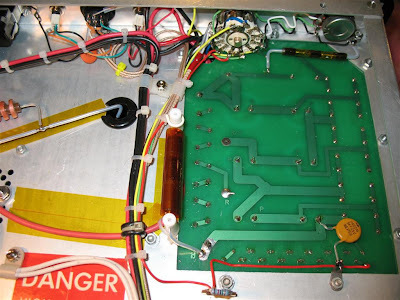 I added an extra RF bypass capacitor between ground and the output of the high-voltage supply. Teflon stand-offs are used to raise the glitch resistor above the chassis and away from other components/wires to prevent arcing. Kapton tape is applied as extra insulation around the high-voltage line. what is the resistor (?) shown on the power supply board top right near the panel potentiometer? Nice job. Good pictures but seems to be a couple of things I couldn't figure out or that wasn't very clear despite the good pictures. What are some of the mod's component values? The two diodes placed across the meter leads. What voltage or amperage are they rated for? What part number are they? The electrolytic capacitor located on the terminal strip directly below the meter. What does it do exactly? What is the component's value? Glitch resistor located beside the Harbach power supply board connected in series with the HV or (red) wire. (It "IS" connected in series with this wire - is that correct?) Type of resistor used? (flame proof 1 ohm - 25 watt type comes to mind - not sure exactly what is used) Resistance value? Part #? What is the length of the replacement "mil spec" coax going to the relay? What is the "RG" number of this cable? Is this cable part of a tuned network? Is length critical? Is cable velocity factor a consideration when compared to replacing the original RG 58 cable? Also did you paint the face panel black? (You said it "came out nice.") or did you order it somewhere? Where can we get one? - Article doesn't mention anything. Otherwise a great job. Sure is helping me rebuild mine. Just a note about anyone building the Harbach Soft Start module. Components are very tight. The two capacitors and 10 watt resistors are bunched together very tightly on the board. Seems if the 10 watt resistors should heat up they will probobly burn into the capacitors because they are touching them. You can "fold out" the resistors "out and away" at a 45 degree angle, (so they don't make physical contact with the capacitors)but then they will hang over the outside edge of the soft start board. The best place to mount insulated standoffs to mount the board are to drill holes in the middle of the letters "C" and "B" as seen on the soft start board. Be sure to install the 2.4 K ohm resistor (R-27) "BEFORE" you put in the relays becuase otherwise you find yourself working in a very tight restricted space for installing this resistor between the two capacitors and one of the relays later on. Also be sure the "power resistors" are not flush mounted directly on the board. They generate heat and everyone knows heat burns boards. I use a popsicle stick to create the needed seperation when soldering them in. Well that's it from me. The "resistor" near the panel potentiometer is actually a string of 3 x 1N5408 diodes (wraped in kapton tape). It is a HV glitch protection for R12 and the meter. During a HV event, a large current will flow through R12, possibly damaging it. If the resistor opens, the HV pulse would also go through the meter if set to the "plate" position. Three diodes (in series) are added in parallel with R12 with *anodes toward ground*(!). These diodes will clamp the voltage developed across R12 to approximately 2.1 volts. The two diodes in parallel of the meter are 1N5408. They are connected in parallel and in opposite direction to each other. The electrolytic cap on the terminal strip is a filter capacitor (100uF/6.3V). There is a diode on this strip as well, which is a rectifier for one half of the filament voltage. This forms a supply of 3.2V DC for the front panel LEDs. The glitch resistor is Ohmite 30J15RE - High-energy 15 ohm /10W resistor. Yes it is in series with the red wire. The coax used is RG-178 for the soft-key circuit and front panel Operate/Standby switch, RG-316 for the two lines between the front panel rotary switch (meter) and the 2 germanium diodes in the SWR bridge and RG-142 for the input/output relay line. RG-400 will also work (it is a more flexible version of RG-142). In the original amplifier RG-58 was used. RG-142 is the same size but it is the MIL high-temperature silver-Teflon version appropriate for power amplifier use. Since this is a 50 ohm cable and the amplifier has 50 ohm input/output this cable is not used for tuning and the length is not critical. You should not worry much about the power resistors in the soft-start mod. These resistors work only for a couple of seconds, during the first stage of the soft-start. For such short period they don’t have the time to get hot enough. Then (in the second stage) they are bypassed so there is no current flowing thru. The reason why such power resistors are used is the high initial current but the thermal mass of the resistors is sufficient to prevent real heating. The front panel is powder-coated and silk-screened. I ordered it from a guy who was making custom SB-200 panels. Unfortunately, I have lost the contact information. He was selling these panels on eBay. Thank you very much for the part numbers and specifications. Very helpful information. Now i'm back to my own SB 200 project. I will install the glitch protection as indicated on the Harbach power supply board and I won't worry about the power resistors on the soft start module so much. I noticed there is a .0022 3 KV disk capacitor on the power supply board. I am assuming this is an RF bypass capacitor. What are your thoughts about substituting a .0039 - 3 KV cap at this location instead? Also some sites suggest using a 10 ohm - 10 watt glitch resistor on the HV wire. You are using a 15 ohm in your configuration. Is that better? Also can you tell me if the anodes from the string of 3 diodes simply terminate at the chassis (gnd.) or is there some additional wiring arrangement required going from the 100k potentiometer to the diode string location? Can't tell in the photos. Also I am replacing the the electrical cord with a new 12 AWG cord. However it seems I am not sure which side on the terminal strip is supposed to be hot and/or neutral. For example is the Harbach soft start "red" wire "pin 2" supposed to connected to the "black" hot side of AC or "white" neutral side? The 0.0022/3kV capacitor is indeed a bypass cap. This is the "last line of defense" against leaking RF back to the power supply. 0.0039 uF will work just fine! I would use at least 3kV rated cap or more (4-5 kV is even better). 10 ohm / 10W "glitch" resistor will work as well. I am using 15 Ohm which would have a little better dampening effect during HV glitch but this resistor suppose to be sacrificed (destroyed) by the HV "glitch" current anyway in order to prevent damages to other parts. The anode of the diode string is connected to the chassis ground. 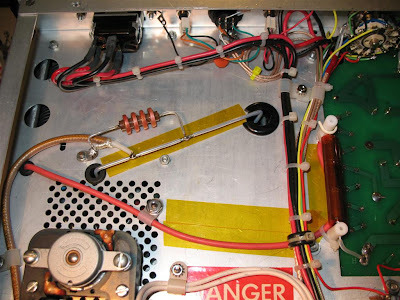 I am using a wire lug on one of the screws holding the power supply PCB to the chassis (near the potentiometer). It is just a convenient place to ground the diodes. The polarity of the AC power cord does not matter - you can connect it either way - both sides of the transformer are symmetrical! The cord is connected to the primary windings of the transformer so the polarization would have no effect - running it on 240V you actually have two HOT conductors (there is no NEUTRAL. 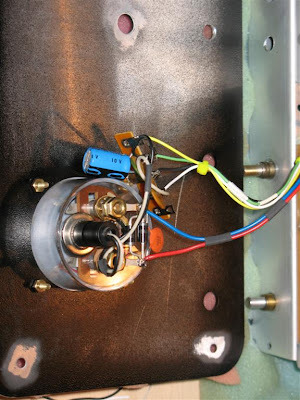 The power transformer acts as an isolator from the mains and there is no connection between any side of the primary winding and the chassis - this will be a disaster if you use 240V). GND connection is a separate conductor in the power cord in both cases - 120V and 240V. In the original schematics the HOT conductor is connected to lug 1 on terminal strip. If you are replacing the capacitors in the SB-200 PS, I would recommend to go with higher value than the original 125 uF. If you have the soft-start mod, you can use 390 uF without a problem! If you dont have a soft-start installed, you still can use bigger capacitors - like 180 or 220 uF. This will give much more stable power supply and lower voltage drop under load. You can buy such capacitors from www.digikey.com (this is the most expensive option), eBay - there are sets of HV capacitors for amplifiers for sale all the time or you can get them from Harbach Electronics ( http://www.harbachelectronics.com/ ). Harbach sells complete power supply module for SB-200 but I am sure they'll sell you only the cap set if you ask for it. I'm new to this amp and would like to know the location of the Key Jack. I need to hook up an Icom Icom IC-718 to this linear. I am using a Relay Saver product and not sure which connection on the back of the linear to use. The relay saver goes to the Send portion on the Icom. Does the other end go to the Ant. Relay input on the linear? The KEY jack is one of the two RCA (or BNC) jacks near the power cord bushing on the back of the amplifier. The jack to the very right of the power cord (looking at the back of the AMP) is the ALC jack. The next one to the right is the KEY jack. Normally, it is RCA type of jack but on some amps I've seen BNC jacks. On the standard SB-200 (without Soft-key mod), the voltage used in this circuit is 120V which could damage some modern transceivers if directly connected to the TX GND jack. The Harbach Soft-Key mod provides an optical isolation and less than 3V on this jack. I am not familiar with "Relay Saver" product, but generally speaking the idea is to use very small voltage at the transceiver side. When this side is grounded, another relay (or solid state component) should provide low resistance to Ground for the ANT KEY jack on the amplifier where the voltage is 120V. When you key the rig in CW or press PTT in SSB mode, the jack TX GND jack on the back will be connected to ground - this commands the amplifier to switch from Rx to Tx. This is 4S7EF. My apologies for the late reply. I was wondering if I should not purchase the PW-200 Power Supply Module & Soft-Start Combo for the Heathkit SB-200/SB-201 and the SK-201 Soft-Key for the Heathkit SB-200/SB-201. Would this make sense? Since I need to purchase the parts from the US should I buy any thing extra from Harbach? THAT'S REALLY A VERY GOOD WORK! Thanks Andy for all your explantion and photos on your Blog! This is one of the reasons that the Amateur radio is one of the Greatest HOBBIES.This is the TRUE Amateur radio. Thanks for sharing your experience with other. I've a Heathkit SB200 and with your modifications I'm doing also on mine. It's also a good way for lkearning a bit! Like me other are familiary with electronics and it's quite easy make this modifications (of course with securirty). hanks for your good example on Demonstarting that the Blogs are also intertesting things. Good Luck and please keep your good work teraching other like me. Andy, How did you power and switch the blue LED to indicate the amp is being keyed? I have the Harbach soft key mod installed and will drive the amp with a Yaesu FT-897D probably using the ALC plug on the FT-897D set to go low when the amp is keyed. Thanks. You've done the most professional SB-200 rebuild I've seen. If I remember right, the blue LED is connected between the rectified half filament voltage and the PTT input line thru a current limitting resistor. I've built a small rectifier - just a diode and electrolytic capacitor for half of the center-tapped filament winding of the power transformer. It gives me aprox +3.2V DC. The Anode of the blue led is connected thru a small value current limitting resitor to this voltage. The Cathode is connected to the PTT input. (I have the Harbach Soft-key (!) This is important! The soft-key provides very low voltage for the PTT input. The original SB-200 PTT has arox 120V and it is not a good idea to use it with modern rig anyway). So when the radio sends PTT, it actually grounds the input, providing trigger signal for the soft-key and grounding the Cathode of the blue led at the same time. The Harbach Soft Key specs say it produces approx. 0.7VDC at 1.5 mA. Connecting the blue LED cathode there would increase the current to about 31.5 mA. I was wondering if you had come up with a way to not connect the LED through the PTT in the exciter rig. According to info at http://groups.yahoo.com/group/FT897/message/31327, if one is using the FT-897D CAT/Linear jack for radio control, you can use an internal jumper to substitute TX GND for TX REQ on the "ring" lead of the FT-897D ACC connector. I've not received a reply from Yaesu to confirm this nor if using the ACC ring lead this way to key the amp has the same V and I specs as on the CAT/Linear TX GND connection. Thus, I asked you how you grounded the blue key LED. The manual states the FT-897D CAT/Linear "TX GND" jack can switch up to + (positive only) 50VDC and 400mA so that connection could easily handle the voltage and current for the soft key and keying LED. It seems reasonable to me that if the info is correct about a jumper to change the TX REQ to TX GND on the ACC ring connector is correct, it would use the same TX GND circuit as is otherwise on the CAT/Linear line. Sooo, I'll connect the LED as you did (used the same technique to light a "lock" light on a control box I made for a remotely located SCG 230 antenna tuner), move the jumper in the exciter and verify the ACC ring goes low on PTT- then fire up this rebuild I started on the dining room table before Thanksgiving expecting to finish it that weekend. For those who will read this in the future, regarding using the rig (exciter) PTT circuit to ground as the return path for the blue key LED (what if something in the 3-4 VDC power supply fails and AC goes into the rig destroying the circuit, or what if something fails and there is a current surge), I picked up two parts from Radio Shack for some extra protection. I added an inline fuse holder in the VDC output of the power supply behind the meter using a 0.315A 250V 5x20mm Fast-Acting Glass Model: 27-1046 Catalog #: 270-1046. (Don't let it dangle near the HV circuit on the power supply below- NOT GOOD TO DO THAT!!!) Since the FT-897D TX GND circuit is rated for up to 12VDC at 400 mA, this should provide excessive current protection for the exciter hardware. As backup protection to prevent AC coming out of the rectifier circuit at the back of the meter and going into the rig PTT circuit destroying it, I added a power diode I had laying around (1N4007) in series with the current limiting resistor in series with the blue LED anode, The cathode is connected to the antenna relay circuit from the jack on the back, before that circuit is interrupted by the new bypass switch which makes or breaks that circuit from the rear antenna relay jack to the Soft Key PCB. I still have to open the Yaesu FT-897D and verify for/ to myself that the ACC ring connection can be changed to provide TX Ground but the Amp passed the pre-power tests and ten the smoke test today and is ready for RF input. Thank you Andrey for taking all the extra time to document your project and sharing your work so others can learn and benefit from your expertise. The front panel is powder coated and then silk-screened with the lettering. A fellow ham made a whole bunch of these and was selling them on ebay years ago. Printing the graphics is the more difficult part - you can sand-blast your existing panel and bring it to any powder coater with requirement for finish and color and it is not expensive. If your going to use any type of decals, you would want a smooth / glossy finish. If you are silk-screening/painting the graphics, then a matte finish is better. For DIY front panel solutions - check also www.texascraft.com - they have some neat materials for making front panels. I recently found your web site. It is in a timely fashion as I "Blew" an original cap in my SB-200. I have ordered the complete replacement board from Harbach as well as the "Soft Start". Being retired on a fixed income the rebuild will come a little at a time. I will have your pics on my screen as I rebuild along with another ham who has a 220 that needs attention. We will rebuild side by side to check and recheck one anothers work. Great job and my hat is off to you for sharing your knowledge and information. As I am "Theory" dumb but I can follow an excellent example. Many thanks from the ham community. Could you please tell me what value R7 is on the Power Supply Board, that's the part I need. Nice page, and well done amp! What is the part number of the new PS filter caps? I've seen a lot of people comment on the Harbach power supply board. While their softkey and soft start boards are excellent and almost essential in some cases, I am not a fan of their power supply board. They use modern capacitors which should have much lower leakage current (and thus require smaller bleed/balance resistors), but the bleeder/balancing resistors they use are still burning almost as much power as the originals. Harbach uses 2 x 82k 3W resistors in parallel, so essentially a 41k 6W resistor, where the original was 33k 7w. And on the Harbach board the resistors are still physically located right beside the capacitors. They are each burning 4 watts which means you have 24 watts of heat right beside your capacitors. Poor design. I recommend using the existing power supply board and replacing the old caps with 500v rated ones. The extra voltage rating along with the lower modern leakage current in current capacitors will let you replace the bleed/balance resistors with ones that are 160k-220k. At that resistance you'll be burning 1W or less each - I use 2W resistors just to increase life.